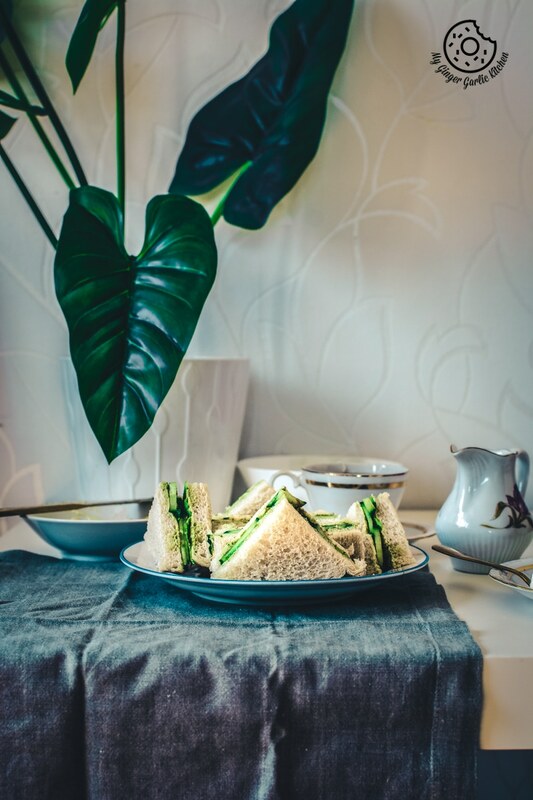 Learn how to make Indian Cucumber Chutney Sandwich Recipe – Tea Time Sandwich recipe with an easy to follow video tutorial. These sleek, presentable, and light sandwiches are so yummy. In this sandwich, freshly buttered bread slices are slathered with a lightly spiced green coriander chutney. Cucumber slices are then layered on bread slices. Then a final touch of chaat masala and roasted cumin powder is what makes an easy yet delicious snack even more glamorous. What is an Indian Cucumber Chutney Sandwich? Indian Cucumber Chutney Sandwich is India’s version of the British ‘Cucumber Tea Sandwich’. This is a simple sandwich made using only 4 ingredients — bread slices, green chutney, cucumber slices, and butter. They are very delicious, and light, and airy. 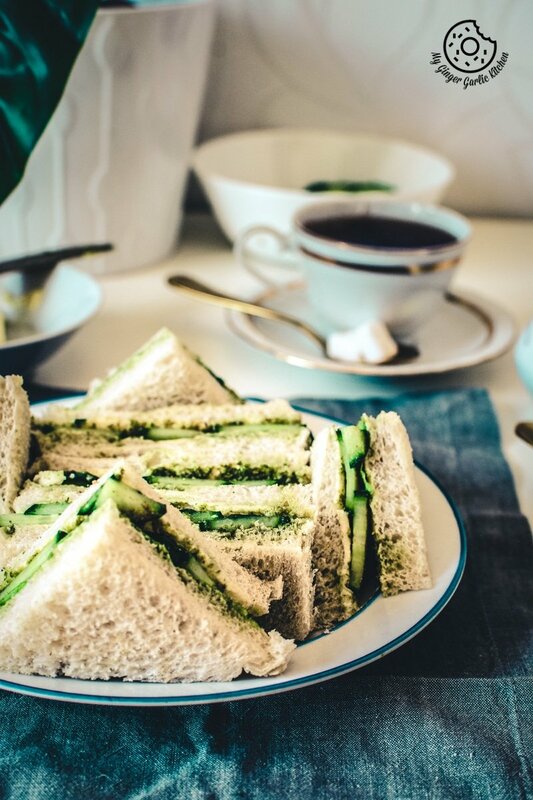 What is the difference between English Cucumber Tea Sandwich and Cucumber Chutney Sandwich? 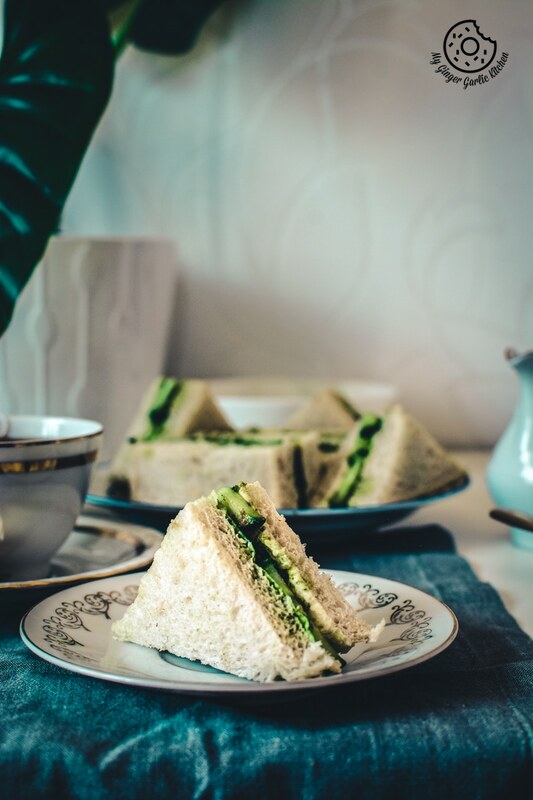 Traditional English cucumber tea sandwiches are made with thin slices of cucumber which are dashed with salt and lemon juice, and after that, they are arranged between two slices of buttered bread. 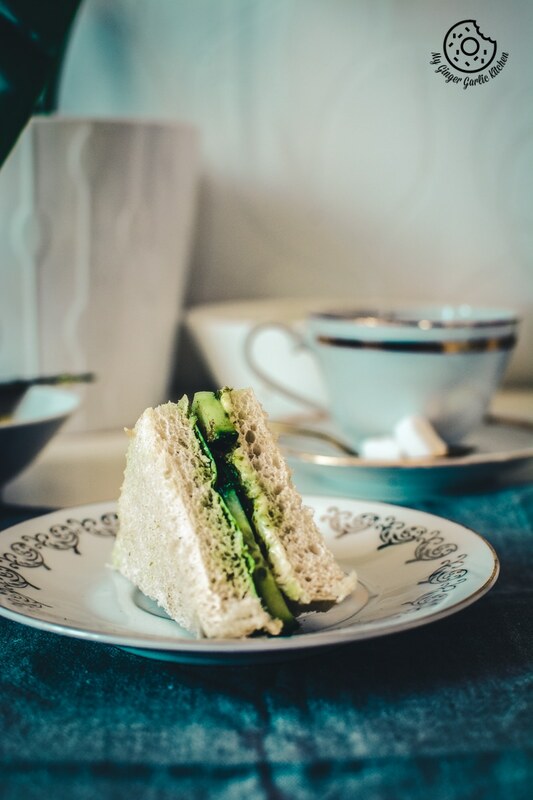 The cucumber chutney sandwiches are an irresistible Indian twist on traditional English cucumber tea sandwiches. You probably have guessed that Indian Cucumber Chutney Sandwich include an extra punch of chutney. These sandwiches have a bonus layer of slightly spiced and flavorful green cilantro chutney. Thus, this Indian sandwich has some added spices, thereby giving these sandwiches a little kick. What is the history of cucumber sandwiches? 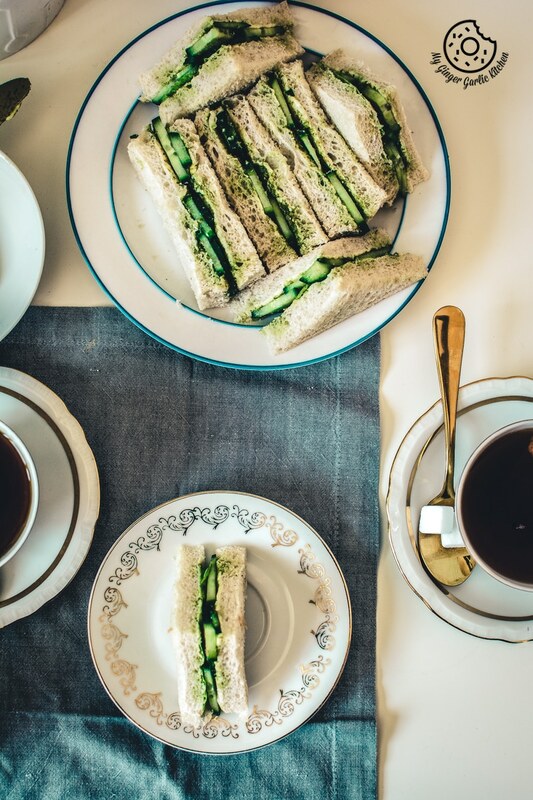 The traditional cucumber sandwich is of British origin, where paper-thin slices of cucumber are arranged between two thin slices of fresh crustless bread. These bread slices are carefully buttered all the way to the edges with the thinnest coating. Why would you surely love this Indian Cucumber Chutney Sandwich? You would love these if you like flavourful Indian dishes. And I have never met anyone who doesn’t like green cilantro/coriander chutney. When we talk about Indian flavors, what else could be a better way to uplift Indian flavors than this some tasty cilantro chutney spread on a buttered bread slice? They are really palatable, and light on the stomach and too addictive. You cannot stop eating when you have a tray full of these cucumber chutney sandwiches staring at you. Is it easy to make Indian Cucumber Chutney Sandwich? Making this sandwich is child’s play — very easy I must say. You only need to know how to puree ingredients, how to slice cucumber, and how to assemble a sandwich. I guess that everyone knows these basic things. Even your little kid can whip up these sandwiches if you have the chutney ready. How long does it take to make Indian Cucumber Chutney Sandwich? You can make these sandwiches in no time. Yes, they take no time at all to make, if you have your green chutney ready. And making green chutney is 5 minutes job, so that’s also not a long time. If you are making everything from scratch like I did here, then I can tell, it would only take 10 minutes from start to finish. Can I make Indian Cucumber Chutney Sandwich with cream cheese? Yes, you can. In fact, if you want to go for a lower-calorie lighter version, then you should opt for the light cream cheese. Simply mix green cilantro chutney with room temperature cream cheese. Slather it on bread slices and then layer them with tons of cucumber slices and a sprinkle of chaat masala. Done! See, it’s that easy. How can I prevent Indian Cucumber Chutney Sandwiches from getting soggy? Fresh bread slices are smeared with butter for preventing the bread slices from becoming damp or soggy. I suppose the main reason of slathering the bread slices with butter was for preventing it from turning soggy. The other tip is to slather the chutney layer in the end and arrange the slices of cucumber just before serving. This would prevent the sandwich from going soggy or becoming damp. Can I use mint chutney instead of coriander chutney for making cucumber sandwich? Yes, certainly you can use mint chutney (pudina chutney) for making these sandwiches if you like that minty punch. You can also use mint cilantro chutney for making these sandwiches. Can I use the same recipe for making Indian cucumber tomato sandwich? Yes, you can. Build a layer of thinly sliced tomato on top of the cucumber slices and the rest of the recipe is the same. Can I use the same recipe for making grilled chutney sandwich? Yes, definitely. You can smoothly make buttery and crispy Grilled Indian Style Chutney Sandwich using this recipe. The grilled sandwiches make a great picnic snack, breakfast, brunch, get-together, or afternoon tea party. You can even make them for your kid’s lunch. Can I also use red chutney for making this cucumber sandwich? If you want a spicy version of these chutney sandwiches, then you should definitely try using spicy red chutney. You can also use a combination of both green chutneys and red chutneys. How to make some other type of green chutney for a sandwich? If you want to try other versions of chutneys, then you can check out some different versions of green chutney recipes here, and here. Can I pack this Cucumber Chutney Sandwich in kids lunch box? Yes, you can easily pack these sandwiches for kids lunch box. Try to use a thick chutney if you are packing them for lunch. And wrap them with cling wrap before putting in the boxes. They would stay fresh for a longer time. Can I serve this Indian Cucumber Chutney Sandwich as a vegetarian lunch for adults? Yes, absolutely. Buttery Cucumber Chutney sandwiches are a perfect meal for adults. They are light on the stomach and have a perfect choice of lunch when you want to have something light, fast, and delicious. Can I freeze this green chutney for later use? Even though making cilantro chutney is a piece of cake, but still, this is the least favorite job for some. If you are one of them, then I have a great alternative for you as follows. If you have some time, you make some extra batches of this chutney by doubling the recipe. And then freeze them into ice cube trays first, and later, transfer those cubes to Ziploc freezing bags. You can store this chutney for up to one month. When you want to use it, then simply thaw cubes at room temperature and they are ready to be slathered on your buttered bread slices. Can I make these cucumber chutney sandwiches for tea parties? 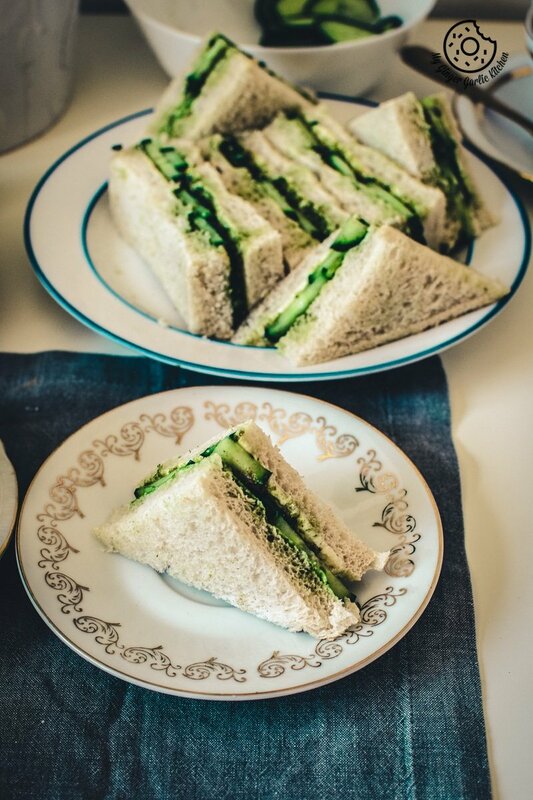 These chutney sandwiches are inspired from English Cucumber tea sandwiches. 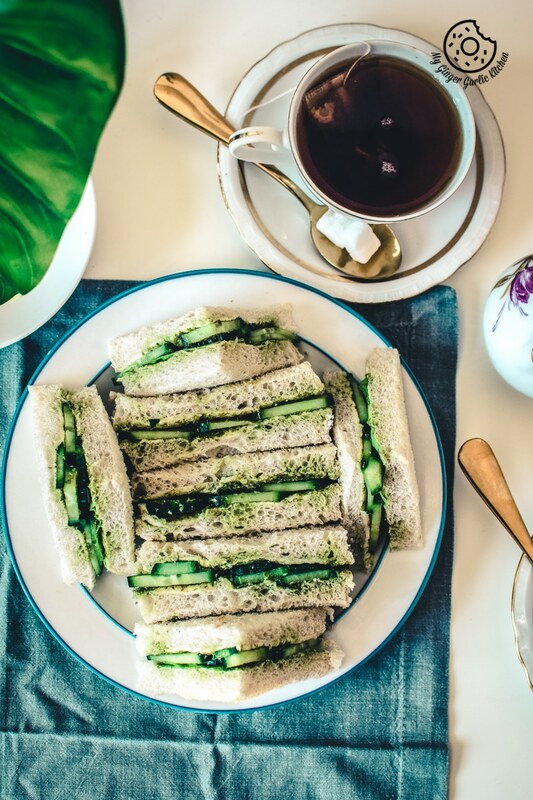 So yes, these pretty looking delicious cucumber chutney sandwiches are so wonderful for a fancy tea party. Your guests would definitely adore these. However, you can definitely make them even without any proper occasion. For me, they are so good when they are served with a piping hot cup of tea or coffee. These sleek, presentable, and light tea time sandwiches are so yummy. In this sandwich, freshly buttered bread slices are slathered with a lightly spiced green coriander chutney. Cucumber slices are then layered on bread slices. Then a final touch of chaat masala and roasted cumin powder is what makes an easy yet delicious snack even more glamorous. 1. Place all the chutney ingredients in a food processor or blender and process into a smooth puree. 1. Lay the slices of bread on your work surface or on a large cutting board. 2. Trim off the crusts using a knife. 3. For every two slices of bread, spread both slices evenly and thinly with butter. 4. For every two slices of bread, spread both slices evenly with coriander chutney. 5. Cover one side of the sandwich with sliced cucumber in one layer. 6. Sprinkle some chaat masala and roasted cumin powder. 7. Cover with the other bread slice. 9. Serve immediately with tea. Enjoy! 1. You can store this green coriander chutney in an airtight container in the fridge.